Sometimes, getting a part-time job or starting a small business isn’t an option. What if you could make a little bit of money without leaving your sofa? Answering online surveys is a way to do that. You’re probably not going to make enough to pay the rent, but you may make enough to pay your cell phone bill. If money is tight, every little bit helps. Imagine if you could make an extra $20 or $40 per month! 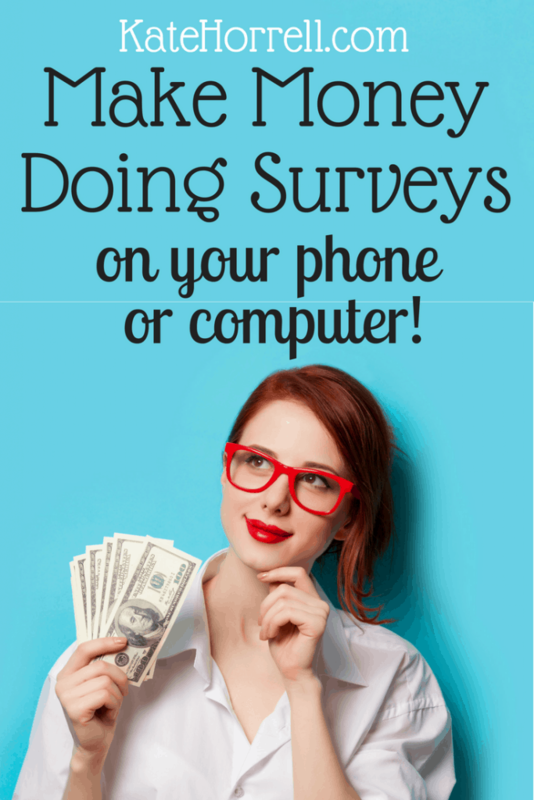 There are two main things that will make surveys more fun and more profitable. First, open up a separate email address for your surveys, so the offers don’t clutter up your main mailbox. Open up a separate email address for this purpose. You can call it something like KatesJunk or SusiesSurveys to help you remember the extra address. Second, check the email regularly. Often, survey offers expire after a short amount of time, and you’ll miss out if you go weeks without checking your email. They ask you for any sort of payment. Legitimate companies will need to know how to pay you, often using Paypal, but they will not ask you to pay them. They tell you that you can make a lot of money. The truth is, you’re not going to make a lot of money filling out online surveys. If the company is advertising that you can make a lot of money, then they’re not being honest. The following survey companies are ones that I’ve used and know are legit. I have a long list of companies that I’m trying out, and I’ll add new companies as I am sure they work as advertised. American Consumer Opinion® is a reputable survey company that offers many potential surveys each month. I’ve earned about $10 a month, and I only reply to a fraction of the survey offers that I receive. You’ll earn more if you respond to all the survey offers that come to your mailbox. Points are redeemed by request once you have more than 1,000 points ($10 in value.) Redeemed point value is sent to your designated Paypal account or to your home by regular check. Swagbucks is a site that lets you earn points for a wide variety of activities, including filling out surveys. Points can be exchange for gift cards for a wide variety of retailers, including Amazon, Target, Walmart, and Paypal (which can be converted to cash.) I used to put some effort into earning on Swagbucks, and I’ve successfully redeemed gift cards. What a fun and easy way to spend a little time – much better than solitaire! InBox Dollars is a lot like Swagbucks, except that your value accrues in actual dollars instead of points. You can earn points for using their search engine, doing surveys, completing offers, etc. You have to be careful not to sign up for anything that you don’t want just to get the rebates, but otherwise this is a good deal. Plus you get a $5 bonus just for signing up! Unfortunately, you have to have $30 for a payout. MyPoints isn’t primarily a survey company, but it does include occasional surveys amongst its ways to earn. You can also print out and redeem grocery coupons, use MyPoints for your online searches, and earn points through shopping and other offers. This isn’t my favorite company because I don’t earn as much through them. I’m not sure if that is because they don’t have the best offers or because I haven’t figured out how to work their system yet. I’ve been a MyPoints member for over 10 years and I’ve redeemed many points for gift cards. This is a great way to do your holiday shopping without spending any money out of pocket! Vindale is like a weird combination of a legitimate survey company and one of the companies that is trying to make a buck off of you. There are good surveys here, but you have to slog through a list of “offers” and then a list of other survey companies to sign up with. One big downside with Vindale is the $50 minimum for payout. One big upside with Vindale is that they have a lot of surveys to complete – it wouldn’t be hard to make $20 in a day if you really put your mind to it. These are the companies that I’ve used enough to feel comfortable recommending to you. Get started with these and see what you think, then you can add new companies as they come along. You won’t get rich, but you might ease your family’s budget just a little. Even $20 or $40 a month can cover a phone bill or pizza splurge!